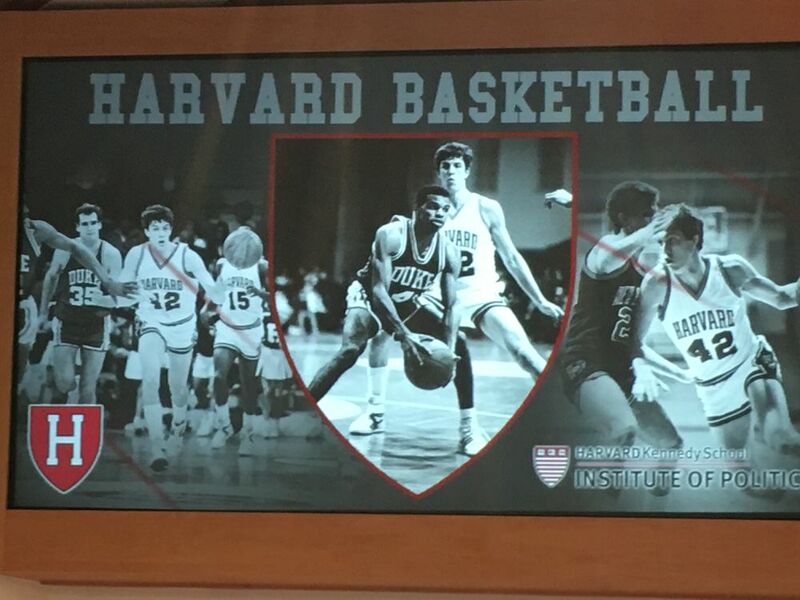 In the 1980s, future U.S. Secretary of Education Arne Duncan ’86 and future Stemberg Family Coach Tommy Amaker faced off on the basketball court, Amaker as a Duke point guard and Duncan as a Harvard forward. This image of the two greeted attendees at a Kennedy School Forum event with Duncan. Moderator David Gergen (left) and Duncan discussed gun violence, education policy, and Duncan’s concerns about the Trump administration. 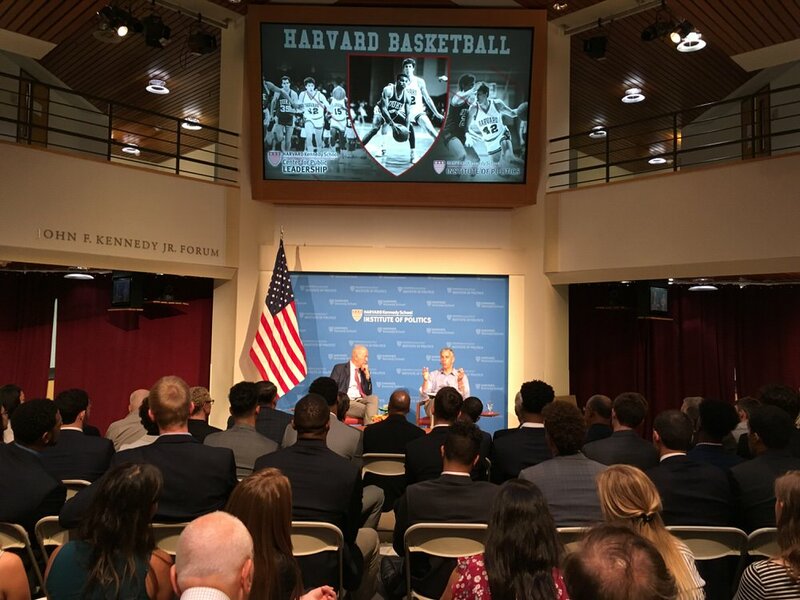 At Tuesday’s Kennedy School Forum event with former U.S. Secretary of Education Arne Duncan ’86, there were echoes of another campus arena: Lavietes Pavilion, the home of Harvard basketball. For one thing, the men’s basketball team filled three rows up front with their sizable frames. “That’s a pretty stunning charge,” responded Gergen, noting that the country’s history of withholding educational opportunities in order to subjugate women and minorities stretches back long before Trump. Duncan also spoke optimistically about the potential impact of the students in the audience, including the basketball players. When asked during a pre-event sit-down with reporters about the team’s transformation since Amaker’s hiring in 2007, Duncan lauded the coach for recruiting talented players (under Amaker, the Crimson has won its only conference titles—six of them), bolstering inclusion (he was Harvard’s lone black head coach when hired), and attracting players from diverse socioeconomic backgrounds.